Raised garden beds are useful to separate the garden bed from the paths and thus protect the soil from people walking on it. It’s a great way to keep mulch contained within the bed, and you can add a framework to protect your plants from insect pests. If you make it waist height you can avoid bending or kneeling; and keep the family dog away; and grow veggies when you have tree roots or concrete at ground level. 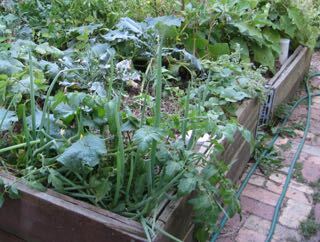 It is generally recommended that a raised bed is no more than 1.2m wide so that you can reach the middle of the bed. The height can be about 25-30cm or up to waist height. It takes time and money to set up, as you need edging material and you generally have to bring in a suitable nutrient-rich mix of compost to fill the bed. For the edging material avoid anything toxic such as treated or painted timber. You could use Reclaimed Cypress Sleepers (Cupresses macrocarpa) or any re-used untreated timber. Other options are pavers, concrete Besser blocks, corrugated iron or eWood (made in Victoria of recycled polystyrene). Angelo Eliades gives detailed instructions on how to build a raised bed on his wonderfully informative website called Deep Green Permaculture: Connecting People to Nature, Empowering People to Live Sustainably.